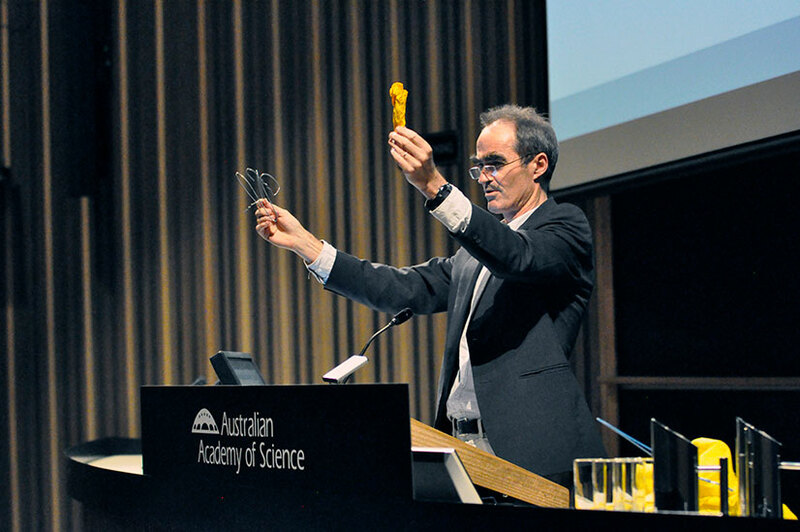 Malaria researcher, Professor Kiaran Kirk spoke about the threat of antimicrobial resistance and the drugs currently in development at the final talk of the Academy’s 2016 Canberra Public Speaker Series. Professor Kirk’s talk: ‘Waging chemical warfare on microorganisms’ looked into the rapid evolution of bacteria, fungi and parasites that cause infectious diseases. Bacterial infections used to be a significant cause of death in humans until penicillin and other antibiotic drugs discovered in the 20th Century helped drastically reduce the incidence and impact of bacterial diseases. However, widespread inappropriate and incorrect use of these drugs in humans and in animals has allowed strains of bacteria to evolve partial or full resistance to our existing drugs, and the pipeline of new antimicrobials in development is critically small. Professor Kirk is Dean of the College of Medicine, Biology and Environment at the ANU. As well as discussing rising levels of antibiotic resistance, he told the audience that the malaria parasite is becoming resistant to our last lines of medicinal defence in parts of South East Asia, surviving longer in the blood when treated with the current frontline antimalarial medication. He explained that the malaria parasite, by hiding inside the liver cells and red blood cells of its victim, makes it very hard for our immune system to detect and destroy the parasite. We are therefore very reliant on antimalarial drugs to combat the disease. The emergence and spread of drug resistant parasites is therefore a grave concern. However, there is hope on the horizon. There are new drugs being identified and developed. Professor Kirk discussed recent work from his lab at the Australian National University, in which a former student, Dr Natalie Spillman, showed that one of these new drug candidates kills parasites by targeting a molecular salt pump, causing a critical build-up in sodium inside the parasite. The drug is now in human clinical trials and shows promise of becoming a much-needed new treatment for malaria. If and when this new drug is released, it will be combined with at least one other antimalarial, to try to minimise the likelihood of resistance arising. During the event the Academy’s 2017 Canberra Public Speaker Series, Dawn of the new space age, was announced, with series passes now available. The livestream is available on the Academy's YouTube channel, and event tweets via @science_academy and the #everydaysci trail on Twitter.